VW is basically selling you a custom paint job. To add some spice to the Volkswagen Golf R, we thought VW should give US buyers the same outrageous paint job options offered in the Canadian market. Much to our surprise, VW listened and decided to open up its Spektrum Program for the 2019 Golf R in the United States. For $2,500, Golf R buyers can now choose from one of 40 available colors, instead of the five no-cost options. Custom colors are available from luxury automakers such as Audi, BMW, and Porsche but VW is the first mainstream automaker to offer such a cool option. We had a chance to speak with Megan Closset, Product Manager for the Golf family, about the Spektrum Program and couldn't believe how much effort goes into these fantastic paint jobs. You may think it is simple for an automaker to offer a car in a new color but the reality couldn't be further from the truth. When someone orders a Golf R through the Spektrum Program, the car is "removed from the assembly line, taken to a special paint shop, then brought back to be finished on the normal assembly line," Closset explained. "Our Wolfsburg facility is absolutely massive" and the special paint booth for the Spektrum Program is far enough away that the cars need to be brought there on a truck. Basically, each Golf R in the Spektrum program receives a custom paint job. As you'd expect from this process, these paint colors will be extremely rare. You "you won’t see more than several hundred," Closset says, so there's a good chance if you order one of these colors, you might get the only one in the world. 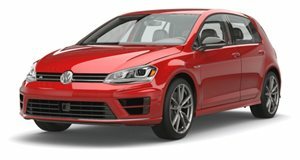 For all of the enthusiasts out there who like to know how rare their car is, Closset says VW will "absolutely" keep track of how many are produced in each color. "Thanks to this unique process, we can even track how many are made for the US market," she added. We asked if there's any chance VW could expand the Spektrum program or continue it into the next generation if it is successful. Closset said she would "love to expand this to the next generation and see how it is received" and possibly offer a "smaller quantity of colors in a more streamlined color program." Once VW gauges which of the 40 colors are the most popular, it will be able to eliminate the unpopular options from the lineup and ease up the painting process. This is similar to how VW decided which colors to offer in the US. "Canada was the gigue pig," Closset explained. "We offered 30 colors and thought, 'why can’t US offer the same thing?' Let's do the same. We eliminated four colors that were never ordered and added 14 for a total of 40. A lot are heritage Volkswagen colors meant to cater to people who had them in the past. Mars Red, for example, was used on the Mk1 GTI. We had a lot of fun choosing the colors." Closset also told us VW had "over 300 colors in theory, but it wouldn’t make sense from a business point of view." Although these colors will be quite rare, they will be stocked at dealerships. "The majority of dealers already have a customer," Closset explained, but we "gave some to dealerships who earned an allocation. The forums are excited and some people will put a deposit on it and fly up to go get it." Of course, you can also order one of these colors from the factory though, according to VW's website, they will be "subject to additional delivery time." The Spetkrtrum colors can be ordered with a six-speed manual or seven-speed dual-clutch and Closset expects to see a "nearly 50-50 split (#savethemanuals)." So even if someone else orders the same color as you, there's a good chance their car won't have the same transmission. We expect these colors to be extremely rare and they should increase in value after enough years.